formerly Regal Lafayette Square Cinema 7, which opened in 1991 and closed in March 2011. The Marquee > Search > Owner/Operator > Odyssey Entertainment, Inc. 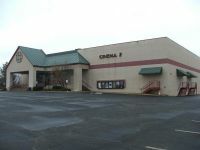 This movie theater is near Williamstown (WV), Reno, Whipple, Marietta, Waverly (WV), Parkersburg (WV), Vienna (WV), Lowell, Newport, Willow Island (WV), Eureka (WV).